Yes this post is about a week and a half late but in my defense traveling with twins has a recovery period. It was crazy, a little insane at some periods of time and definitely sleepless but, all in all, our trip to Indiana to visit family was a good one. It is a blessing to see your babies loved and celebrated and that week in Indiana they were definitely that. They met Great Aunts, 2nd cousins and 3rd cousins, Great Grandpas, and Great Grandmas and they were truly celebrated and loved by all. One of the greatest visits was when we went to spend some time with Phil's 92 years old Grandpa. I have always enjoyed the time I have spent with Harry. From what I know about this 92 year old man in the 2 times I have met him is that he loves living life. The ordinary, everyday life, pulling dandelions, picking up sticks, keeping his yard nice, being with his family, driving his car and going out for fish on Friday nights...he loves it. 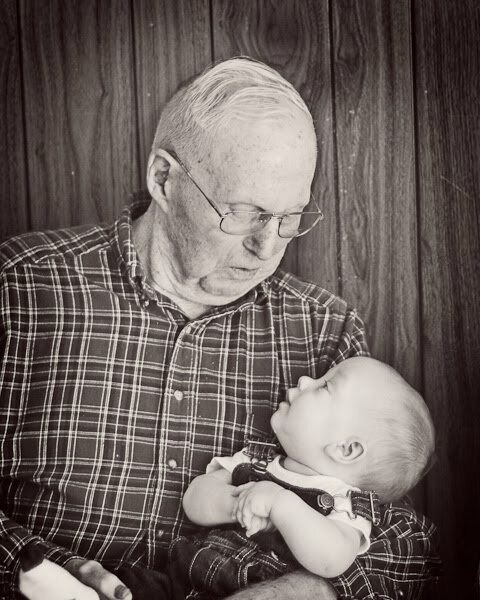 He really loved meeting his newest Great Grandchildren. He expressed himself with genuine excitement as he held them and said over and over, "wonderful, wonderful this is just a wonderful day!" Harry and Dorothy loved watching them, talking to them and holding them. They even said, "Alright you guys can go now, we'll be fine here." Mama wasn't about to leave her babies but it was fun to know their hearts to spend quality time with them. That one beautiful afternoon watching two 5 month old babies interact with their Great Grandparents was worth the sleepless nights, the mean looks from strangers on a plane and the all around craziness of traveling with twins. Today I'm grateful my babies are so loved by family. What great pictures! 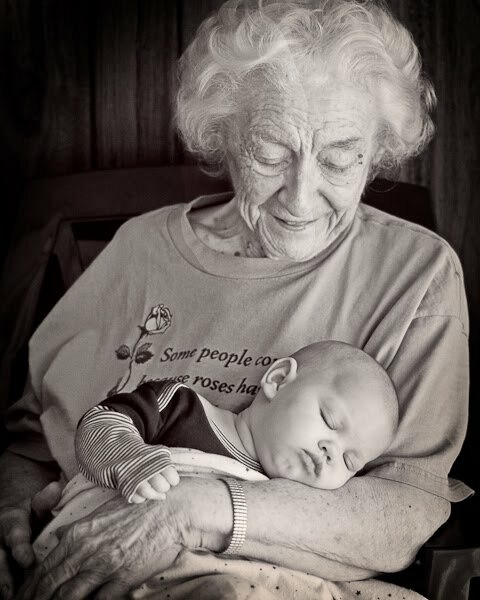 I know that the great grandparents will remember this experience for a long time. Thank you for being willing to share the babies with them.